Thursday was the first time in a couple of weeks that I managed to write anything substantive (and, boy, am I ever happy to be done with Game of Thrones for a while), but it still wasn’t as much as I’d have liked. That said, I read two full books and have spent some time working on outlines for my backlog of book reviews, plus I had a good idea for a future feature here that I’ll be working on with the tentative plan/hope of starting it after the first of the year. I’m still trying to stay away from making promises about my productivity or what I’ll be publishing this week, but right now, Sunday evening, I’m feeling more optimistic about the upcoming week than I have in some time. I’ve read some great books lately, and I’ve got an exciting Fall Reading List in the works (watch for that next week), so I’m determined to turn out as many reviews as possible before I do my quarterly clearing of my schedule so I can start the new season with a clean slate instead of an enormous backlog of unfinished projects. Next weekend brings the first episode of Star Trek: Discovery, and season premieres of The Good Place, Lucifer, and The Shannara Chronicles (and Bob’s Burgers and Dancing with the Stars) coming over the next month or so as well, so there will be plenty to watch and write about in the coming weeks. I’ve even got a few movies on my to-watch list (Wonder Woman, The Girl With All the Gifts, Colossal, It Stains the Sand Red) that I may have something to say about when I watch them. Finally, I still haven’t forgotten about Gormenghast; I am coming back to you, Mervyn Peake. Ideally, I won’t be coming down with any more nasty colds or other productivity-killing conditions for a while. My mental health has been improving steadily(-ish), and I’m so very ready to start turning that into words on a page. And now for links! 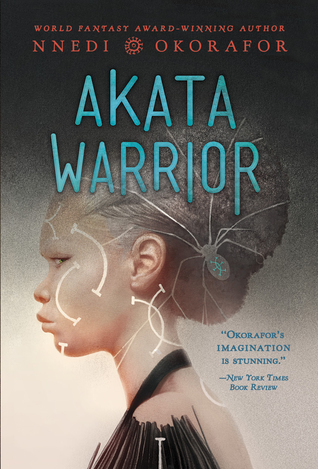 Nnedi Okorafor’s new YA novel, Akata Warrior comes out October 3. The HBO adaptation of Nnedi Okorafor’s Who Fears Death has a screenwriter according to executive producer George R.R. Martin. Adam Savage interview at SyFy Wire. The first of Martha Wells’ Murderbot Diaries, All Systems Red, is one of my favorite novellas of 2017 so far, and there are three more planned in the series. The second volume, Artificial Condition, has a cover, a release date (May 8, 2018), and a cover, and Martha Wells was interviewed about the series over at The Verge. Also coming in 2018 is a pair of novellas by Mary Robinette Kowal as a follow up to her 2013 novelette, “The Lady Astronaut of Mars.” Check out the covers and descriptions for The Calculating Stars and The Fated Sky. 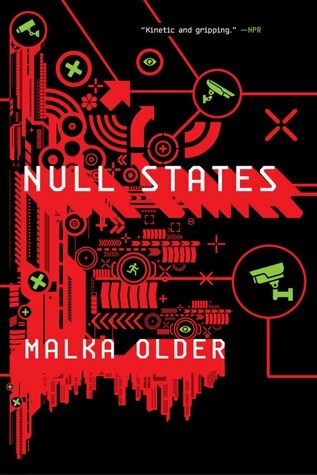 Malka Older’s Null States is one of the fantastic novels I’ve read in the past couple weeks while being sick, and its official release date is this Tuesday, September 19. I’m working on a full review, but I’ll say right now that you need this book. Older herself wrote two posts at Tor.com this week talking about the book and its premise: “It’s Not a Good Idea to Forget About the Null States” and “Writing Political Science Fiction by Observing the Present.” Malka Older, her experiences and ideas are fascinating, and I increasingly find myself hanging on her every word, so I was thrilled to see her interviewed at Nerds of a Feather this week as well, where she’s every bit as erudite and entertaining as her books are. Catherynne M. Valente wrote about the Big Idea in her new middle grade novel, The Glass Town Game. Claire Eddy, Ibrahim Al-Marashi, Anoud and Dr. Zhraa Alhaboby wrote about several of the many Big Ideas in Iraq+100. 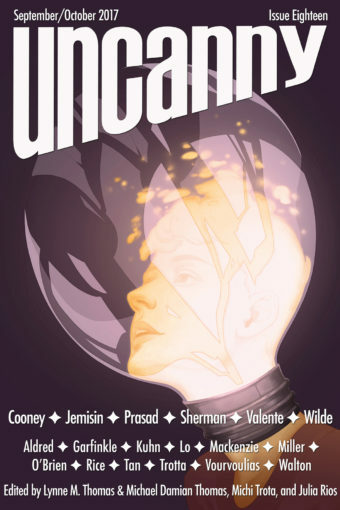 The most recent anthology from Laksa Media is The Sum of Us: Tales of the Bonded and Bound, which collects SFF stories about caregiving and caregivers. Editors Susan Forest and Lucas K. Law talked about their Favorite Bits and Big Ideas this week. The Book Smugglers Level Up Kickstarter is almost halfway funded. Thea James and Ana Grilo popped in at Terrible Minds to share five things they’ve learned starting a short fiction program from scratch. At Pornokitsch: Sweet Savage Love, Romance and Realism. Luminescent Threads: Connections to Octavia E. Butler, from Twelfth Planet Press, is a collection of essays and ephemera about Butler and her work. At Book Riot, Laura Sackton shares what SFF taught her about queer family-making. If you’re on Twitter, you might have seen it already, but #drawingwhileblack is so full of wonderful art and amazing talent, and I’ve been getting so much joy from checking up on the hashtag repeatedly this weekend. There’s a new reviewer of short SFF stories in town. Be sure to check out and subscribe to SFF Reviews. Honestly, though, you owe it to yourself to just go ahead and buy the issue so you can read Catherynne M. Valente’s Cthulu Mythos and Clockwork Orange mash-up, “Down and Out in R’lyeh” and Vina Jie-Min Prasad’s “Fandom for Robots” right away. Chapter Four of Sarah Gailey’s serial The Fisher of Bones is up at Fireside Fiction. There’s a new Kameron Hurley story in this month’s Apex Magazine: “Tumbledown.” And an interview with the author. I think all creative people can relate, to one degree or another, to Kameron Hurley’s most recent blog post on creativity and the fear of losing “the magic.” This was a surprisingly heartening take on the topic. Finally, Fangirl Happy Hour is asking for media recs! The current theme is pirates, in honor of Talk Like a Pirate Day. Check out their cool form and submit stuff. Recs will appear in the Fangirl Happy Hour newsletter.